Starting centers at the beginning of the year can always be a nightmare, especially in Kindergarten! We practice working in small groups with very simple activities for awhile, before I actually introduce my center rotation chart. I want students to be able to work together, learn how to stay in one spot, and use appropriate voice levels during center time, before I begin to really implement centers the way I want them to run. 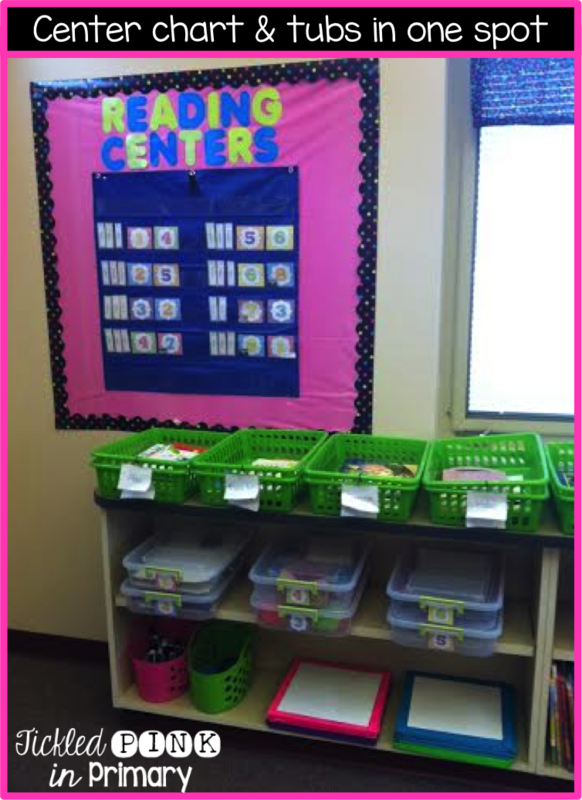 When it is time to officially start centers, I keep all of my reading center materials and chart in one spot. I have 2 focus walls in my classroom: reading & math. Reading is on one side of the room, and math is the opposite side. This makes it easy for students to know what we are learning, by which wall & side of the room we are facing. 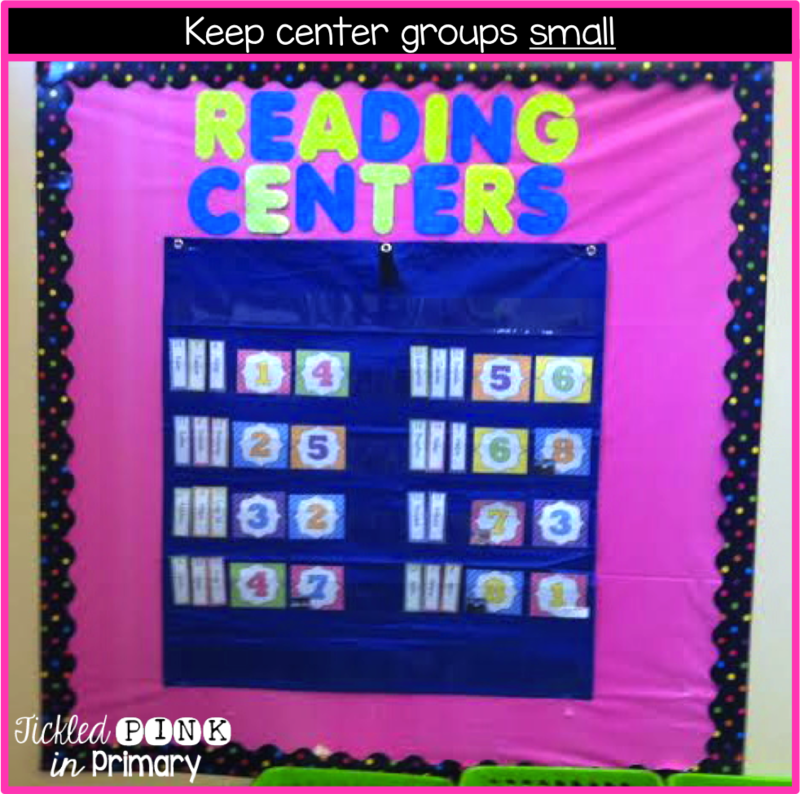 I keep my reading centers activities by the reading wall, and the math centers by the math wall. This makes it a lot easier for Kindergarteners. Keep your center groups small!!! Doing this will help keep students be more focused and quieter. I try to keep groups to 3 students. Depending on my class size, some groups may have 4. I give each group a leader (first name on the center chart) to help answer questions about the center activities, keep noise level appropriate, and get/put away the center tub. Having a leader saves you from hearing all the arguing about who didn’t clean up or who gets to go get the tub. In the picture above, I have my student names on the left and the 2 centers they go to that day next to their names. I use number cards instead of center names. 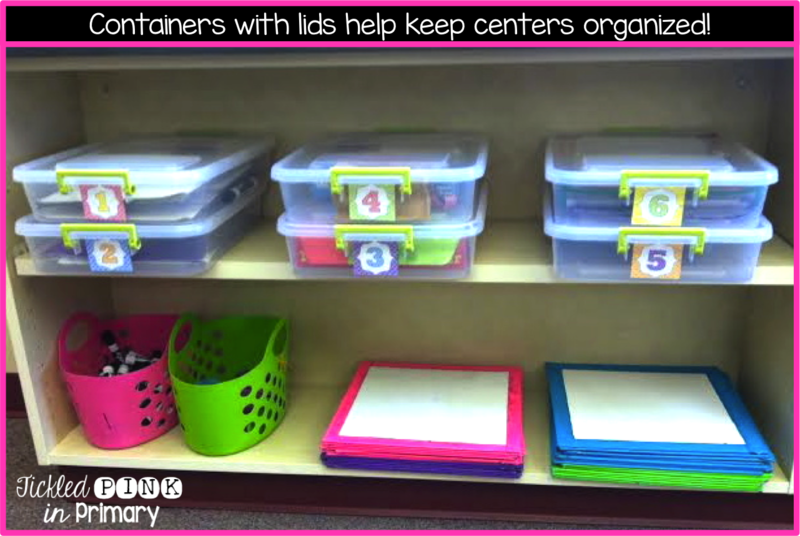 On the front of my center tubs (pictured below) are the same numbers cards that are on the chart. I also color coordinate the tubs to the table they’ll go to. K.I.S.S methon (Keep It Simple Stupid) 🙂 The number 1 is pink, so they go to the table with the big pink pom pom above it. For the places that don’t have a table (library, wipe-off boards, technology) I take a picture of that area & put it onto the number card on the chart. It’s hard to see but #8 as a computer in the bottom corner, #7 has a picture of my library. I used to have big open tubs for my activities and they were always so messy! Now everything the students need is in this tub and they stack nicely. I got these tubs at Wal-mart for around $3 I think. I use the same tubs and same center set-up for math. Getting centers ready can be very time consuming. I only change a few of the activities out after I feel like students have gotten enough practice with them. I also let my students choose 1 activity (if they want) from each container that they want to keep in there a bit longer. I have a few permanent centers that I never have to worry about: wipe off boards, library, & computers/iPad. I made these wipe-off boards from shower board at Lowes. They cut it down for me to 12×12 boards for FREE b/c I was a teacher! I then added duct tape to make it pretty and protect students from the possible sharp edges. Here are a few center rotation cards that I have used in the past. The cards below come from my Reading & Math Center bundle. These cards are editable so you can add your own text. Theses Literacy Center cards are a bit more specific and include 24 different cards. You can edit these as well.